Cut each string cheese stick into thirds. Snip the ends of each third into thin strings to look like a broom. 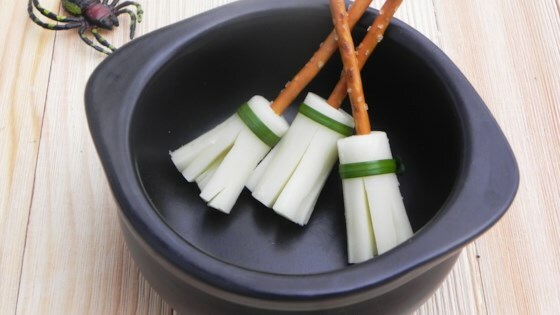 Place a pretzel stick into each piece of string cheese to create the broom handle. Tie a spinach strip around the cheese. Turn your plate of hors d'oeuvres a little spooky with these broomsticks and your next bite will take flight! These were really cute and tasty. A big hit at a party. I followed the suggestion to use chives to tie the broom and they worked well. I will make it for my next Halloween party. Went with chives too - these were a hit! These were so good, I used green onion strips instead of spinach. I served them with a hot and spicy honey mustard dip! They were a huge hit at our work Halloween party!